How to Use a Spotify Playlist as Your Alarm on Android. How to Transfer YouTube Playlists to Spotify. How to remove backgrounds from photos in seconds? Spotify offering free mobile streaming service in the near future? Some people claim that desktop programs land on the scrap heap, which is undoubtedly an exaggeration. Web-based alternatives, however, have set a great trend over the web and are becoming more and more popular and useful. Moreover, they are usually free and provide the same benefits as desktop software. That beats having to spend vast sums of money. • Less functions than in the desktop alternatives. Especially the latter issue looms large in many people’s mind as they prefer to invest a lot of money in a more professional software. It is worth noting that online applications are significantly developing and offer more great output, easiness and functionality. Besides, we do not use many of the advanced features included in the desktops. They are great and all, but we pay for them, believing fondly that we will need them, but in fact we do not use them. Most Web services provide a complete package of features that will satisfy both beginners and intermediate users as well. Bearing in mind this introduction, let's get through our alternatives. Microsoft Office is one of the best-selling software in the world. The Redmond company earns a fortune and regularly releases new versions. Apart from regular price, you can also find more expensive options equipped with more advanced features. 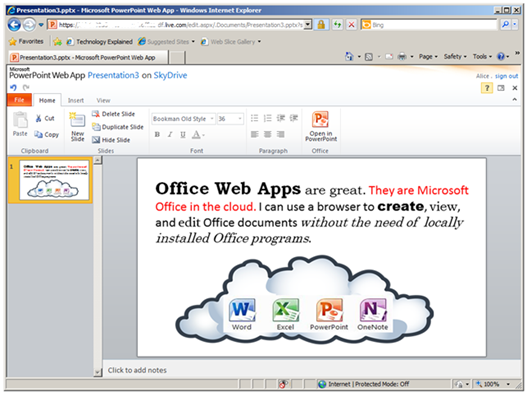 An on-premise Microsoft deployment also offers web-based office alternative, namely Office Web Apps. This free suite of cloud apps comes equipped with Word, Excel, PowerPoint, and OneNote. Plus, you get 7GB of free storage space on SkyDrive, where you can store DOCX or XLSX files. Office Web Apps is geared toward those who are accustomed to the new Office's desktop interface. If you do not care about the look, but still want to carry out basic office tasks without paying a cent, then Google Drive is a great solution. With Google Drive we can easily create text documents, spreadsheets, presentations, forms and drawings. It is also integrated with other Google applications so you can enjoy Gmail. Besides, in both cases it is hard to argue with the price, which is free. Adobe Photoshop is another giant that remains a top pick on the market for many years. The cost of standard version runs between 189$ and 300$, and its Elements will cost even more. Fortunately, there are quite powerful alternatives currently available on the market such as Paint.NET or GIMP. Besides, we have a web applications at hand, which offer some basic functionality, but are very useful in case you want to make image-wide corrections to your travel photos, with a few little re-touches here and there. By no means, worth recommending is Google+ Photos, formerly known as Picasa. In order to use it, go to Google+ Photos, where you can upload your photos. By clicking on any of them, the Edit function opens a convenient control panel with options such as AutoCorrect, Crop, Rotate, Sharpen and more. Not to mention more than 20 filters like '60s. If you are looking for something more powerful, you should try Pixlr. It is a deeply impressive web-based image editor that features interface similar to that known from Photoshop. There is a toolbox with tools on the left, panels on the right and menus with advanced features at the top of the screen. Pixlr lets you save images to your hard drive, as well as easily share them on Facebook. Registered users can use the library on the editor’s servers. 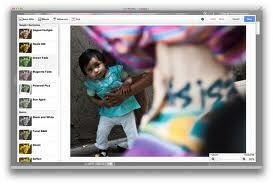 The third alternative, namely Adobe Photoshop Express, offer similar capabilities. As with the aforementioned Office's alternatives, Adobe Photoshop substitutes are also free. Skype is a free instant messaging software, but it has a lot of disadvantages. Most of them cover the issues of unnecessary functions and the fact that it is resource hungry. The program is indispensable when it comes to a voice calls to a phone number, but a large part of users communicates using Skype-to-Skype calls. If it is not enough for you, you would better opt it out to try a simpler solution. Among the best alternatives is Google Talk Google integrated with Gmail. If you do not have a Gmail, but uses Facebook, you can go to the Messages option and talk with your friends on this site. Those who are tired with cluttered Winamp’s interface, we recommend to check alternative music player which is Foobar2000. If you decided to give up listening to songs locally, the application offers a truly impressive collection of online music services. Another most popular music solution is Spotify. You can either use it for free or purchase a paid version which is ad-free. If you do not need a social function and other add-ons, and just want to listen to music you can choose ShoutCast, which provides a wide range of radio stations. Other possible solutions are Polish music networks such as Polish Station or Open.fm. They offer dozens of thematic radio stations. They are also available on mobile devices, and support ads but luckily there are not a lot of them. This integrated with Windows video player has gained a bad reputation for years. The program has problems running HD videos, which use less known codecs and file formats. One of the most interesting desktop alternative is Media Player Classic, which comes bundled with K-Lite Codec Pack. If you plan to completely switch to watching movies online, you will surely be interested with Netflix. Another alternative is a Polish VoD services such as Vodeon. Read more about this subject in one of our articles. Notepad is one of the most primitive programs integrated with Windows. Users often use it to create short lists and notes, which are stored as a TXT file on the disk. If you have a lot of them, you can really get lost in the mix. One of the most popular online applications to create notes is Evernote. This is a rare example of Web service, which is surprisingly more complex than the desktop solution. It allows you to save text, collect images, videos, links to videos, as well as organize and look for them. If you often use your Google Drive, you should test other tool called Google Keep. It is less powerful than Evernote and needs some improvement – however it has been released recently. An important advantage of this alternative is seamless integration with the Drive. Pinnacle Studio is an equivalent of Adobe Photoshop in the world of video editing. The program is addressed toward intermediate and professional users. There is no need to buy this software if you occasionally make a short holiday video. You can use the built-in YouTube video editor, instead. It allows you to mount the scenes, add soundtracks or create animated transition effects. At the end, you can upload your videos to a popular website. The second option has been recently described by us. It is a Google Chrome extension called WeVideo. It works with Google Drive and has more than 100 transition effects and animations. There is also the possibility to upload the content to the web. Of course, both alternatives come free of charge. WinZip and WinRAR are one of the most pirated programs available on the Internet. Both applications are popular, useful, but unfortunately paid. When it comes to unpacking ZIP-s, Windows features a built-in mechanism to create and open such files. The situation is much or somewhat worse when talking about RAR. The only reasonable solution is to use a free alternative such as 7-Zip or the online application such as B1. It supports B1, ZIP, RAR and 7Z formats. It is simple to use and the unpacking process is limited to uploading a file and several clicks. Adobe Reader is one of the most widely used solutions for viewing PDF files. The program is free, but hardly anyone likes his big appetite for system resources. In this case, you can also use other desktop applications, such as Foxit Reader. Much more convenient way to manage PDFs is to use the browser plug-in and open PDFs in tabs as well as websites. Most browsers support this feature - if it does not work properly, check the settings. If you need more options, you can check them out while viewing PDFs, for example you can save the file to your hard drive. Many well-known anti-virus software come with a price attached to it. In addition, there are lots of free and interesting solutions available on the market these days, such as the Comodo Internet Security. But what if we want to perform occasional scans, for example while repairing our friend’s computer? Then, online scanners come in handy, such as those available on the ESET’s website. Online scanners don not offer real-time protection and so should never be considered a substitute for any antivirus software. But if you need to perform some basic tasks, an online scanner can be a valuable tool to use.